First thing to consider. Of little use to take the offer of a 1GB stick to only U.S. $ 10, if that space is not enough to meet the needs of data storage or transfer. The pen drives fill up fast, because not only serve to keep copies of important files, but also for carrying your digital life: from the collection of favorite music to the holiday photos. So it always pays to choose a higher capacity memory you can buy. There are up to 64GB (from U.S. $ 120 in USA). The standard USB 2.0 is faster and, in turn, ensures backward compatibility. That is, it can be used without problem on a computer with USB 1.0 port. But beyond the norm, not all memories copied and read data at the same speed. For example, higher capacity are slower to copy data in memory to read it. And to make matters worse, it is often difficult to compare the speed between memories of different brands, because some manufacturers indicate the speed in megabytes per second (Mbps), while others identify with the letter X (200X, for example). Moreover, in practice two USB sticks of the same speed can have an uneven performance. Sometimes it does not hurt to read consumer comments posted on forums and other websites. Another point to consider is that ReadyBoost capable USB memories serve to increase the RAM of the PC with Windows Vista. And they are very fast memories. 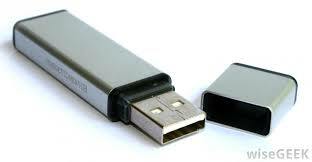 Small caps keep the USB flash drives clean and safe when frenzied dance memory in your pocket or purse. But, as is easy to lose or break these covers, good designs able to adjust on the opposite end. When you want to hang the keychain memory should choose models with metal ring, because the plastic will break easily. There pendrives thin and others thick. In no case are cumbersome to carry, but the fatties can have problems sharing space compu USB ports with other devices. In particular, on notebooks. It is best to choose memories thick thin before.